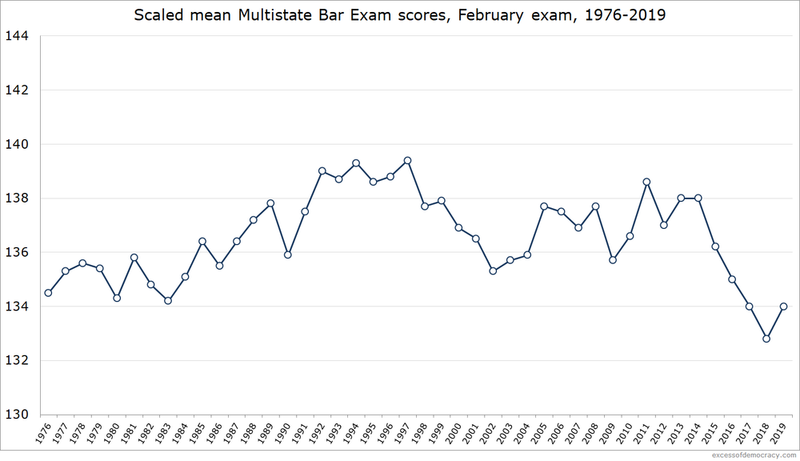 Earlier, I blogged about the disconcerting conclusion from recent bar performance and the results of a California State Bar study that law school “bar prep programs” appear to have no impact on students ability to pass the bar exam. But what about specific substantive course areas? Does a student’s performance in, say, Torts translate into a stronger bar exam score? First, let me aclear a little underbrush about what claim I’d like to examine. We all know that students take some subjects that appear on the bar, but most don’t take all of them. Virtually all law school graduates take a specific bar preparation course offered by a for-profit company to help train them for the bar exam. But law schools might think that they could improve bar passage rates by focusing not simply on “bar prep,” but on the substantive courses that will be tested on the bar exam. If bar passage rates are dropping, then curricular reform that tries to require students to take more Evidence, Torts, or Property might be a perceived soslution. So what exactly is the relationship between substantive course area performance and the bar exam? Not much. They then looked at whether The LSAC study examined first-year subject-area grades; first-, second-, third-year grades; and overall law school GPA, and their correlations with MBE subject areas. The higher the number, the closer the relationship. Torts is an illustrative example. The relationship between the TORT/L (grades in Torts) and the performance of students on the MBE area of Torts is 0.19, a relatively weak correlation. 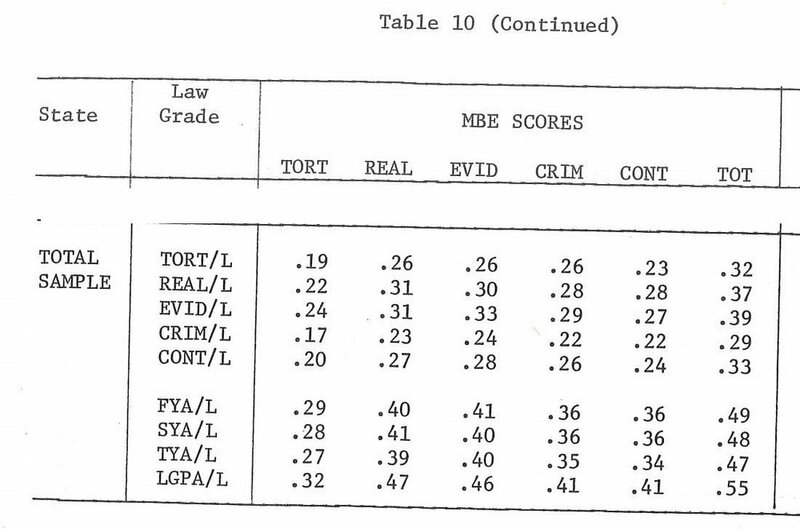 But grades in Torts were more predictive of performance in Real Property, Evidence, Criminal Law, and Contracts—perhaps a counterintuitive finding. That is, your Torts grade told you more about your performance in the Property portion of the bar exam than the Torts section. Again, these numbers are relatively weak, so one shouldn’t draw much from from that noise, like 0.19 to 0.26. In contrast, LGPA/L (law school GPA) was more highly correlated than any particular bar exam subject area, and highly correlated (0.55) with the total MBE performance. Recall that overall law school GPA includes a number of courses—bar related and not—and that it’s more predictive than any particular substantive course area. The LSAC study dug into further findings to conclude that the bar exam is testing “general legal knowledge,” and that performance in any particular subject area is not particularly indicative of strength of performance on that subject area on the bar exam. The short of it is, this is good evidence that the important thing coming out of three years of law school is not the substantive transmission of knowledge, but the, for lack of a better phrase, ability to “think like a lawyer” (or simply engage in critical legal analysis). Bar prep courses the summer before the bar exam are likely the better place to cram the substantive knowledge for the bar; but the broad base of legal education is what’s being tested (perhaps imperfectly!) on the bar exam. We also have the results of a recent study by the California State Bar. The study looked at student performance in particular course areas and the relationship with bar exam scores. After examining the results of thousands of students and bar results from 2013, 2016, and 2017, the findings are almost identical. The study did, however, make an interesting finding and reached what I think is an incorrect possible conclusion. The study discovered that cumulative GPA in California bar exam-related subject areas (listed above) was significantly more highly correlated with the cumulative GPA in non-California bar exam-related subject areas. It went on to find no relationship (in some smaller sets of data) between bar passage rates and participation in clinical programs; externships; internships; bar preparation courses; and “Non-Bar Related Specialty Course Units” (e.g., Intellectual Property). I’m not sure that’s the right assumption to reach. I think that the report understates the likelihood that grade inflation in seminar courses; higher inconsistency in grading in courses taught by adjuncts; or grades in courses that don’t measure the kinds of skills evaluated on the bar exam (e.g., oral advocacy in graded trial advocacy courses) all affect non-bar-related course GPA. That is, my suspicion is that if one were to measure the GPA in other substantively-similar non-bar-related courses (e.g., Federal Courts, Antitrust, Secured Transactions, Administrative Law, Merger & Acquisitions, Intellectual Property, etc. ), one would likely find a similar relationship as performance in bar-related course GPA. That’s just a hunch. That’s what I’d love to see future reports examine. That said, both in 1976 and in 2017, the evidence suggests that performance in a specific substantive course has little to say about how the student will do on the bar—at least, little unique to that course. Students who do well in law school as a whole do well on each particular subject of the bar exam. When law schools consider how to best help prepare their students for the bar, then, simply channeling students into bar-related subjects is likely ineffective. (And that’s not to say that law schools shouldn’t offer these courses!) Alternative measures should be considered. And I look forward to more substantive course studies like the California study in the future. Why are law school graduates still failing the bar exam at a high rate? The first decline took place in the July 2014 bar exam, which some believed might be blamed on an ExamSoft software glitch. Then came continued declines in the July 2015 exam, which some blamed on the addition of Civil Procedure to the Multistate Bar Exam. The declines persisted and even worsened. 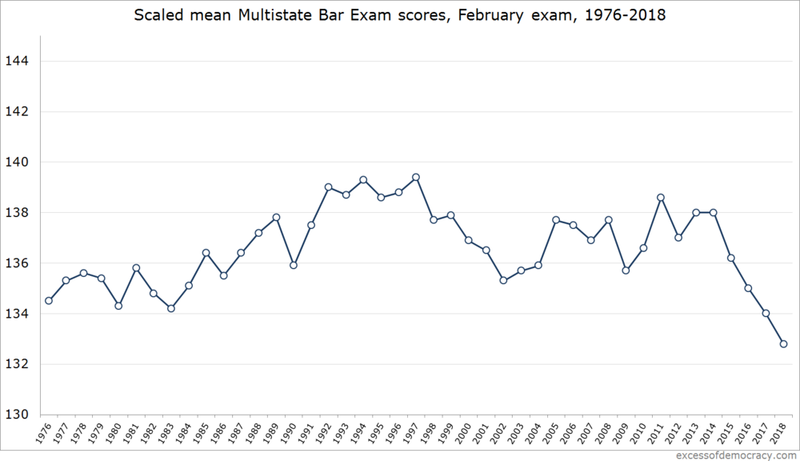 Five straight July bar exam cycles with persistent low pass rates across the country. But the bar exam has not become more difficult. Why? One reason rates remain low is that predictors for incoming classes remain low. LSAT scores actually declined among the most at-risk students between the incoming classes admitted in the 2011-2012 cycle (graduating in 2015) and the 2014-2015 cycle (graduating in 2018). The 25th percentile median LSAT among full-time entrants dropped 2 LSAT points between those who graduated in the Class of 2015 and the Class of 2018. Indeed, 11 schools saw a drop of at least 5 LSAT points in their 25th percentile incoming classes—almost as many as those that saw any improvement whatsoever (just 12 schools, including Yale and Stanford). Not all LSAT declines are created equal: a drop from 170 to 168 is much more marginal than a drop from 152 to 150; and a drop can have a bigger impact depending on the cut score of the bar exam in each jurisdiction. 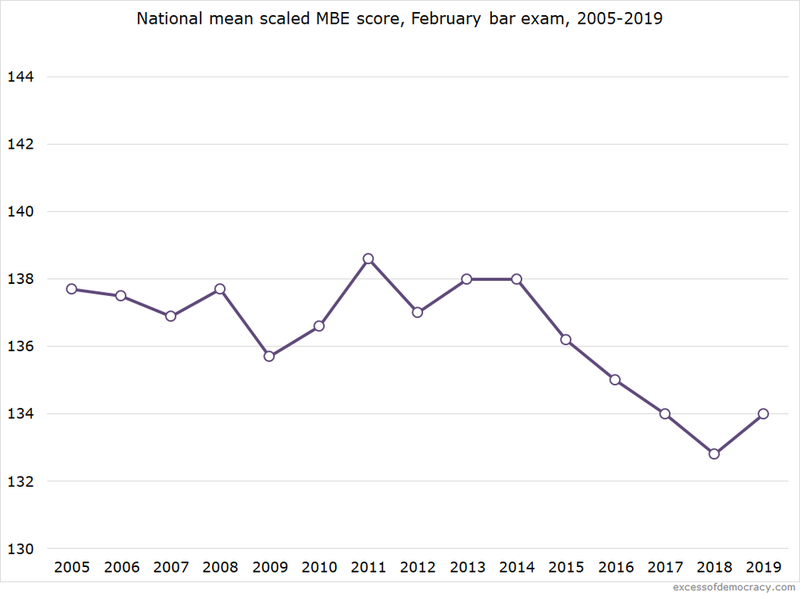 But it’s no surprise, then, to see the persistently low, and even declining, bar passage rates around the country with this quick aggregate analysis. Nevertheless, since around September 2014, law schools have been acutely aware of the problem of declining bar passage rates. Perhaps it was too late to course-correct on admissions cycles through at least the Class of 2017. But what about academic advising? What about providing bar preparation services for at-risk students? Given that law schools have been on notice for nearly five years, why haven’t bar passage rates improved? I confess, I don’t know what’s happened. But I have a few ideas that I think are worth exploring. First, it seems increasingly likely that academic dismissal rates, while rising slightly over several years, have not kept pace to account for the significant decline in quality of entering students. Of course, academic dismissals are only one part of the picture, and a controversial topic at that, particularly if tethered to projections about future likelihood to pass the bar exam on the first attempt. I won’t delve into those challenging discussions; I simply note them here. Another is that law schools haven’t provided those academic advising or bar preparation services to students—but that seems unlikely. Still another, and perhaps much more alarming, concern is that those bar services have been ineffective (or not as effective as one might hope). And this is a moment of reckoning for law schools. Assuredly, when the first downturns of scores came, law schools felt they had to do something, anything, to right the ship. That meant taking steps that would calm the fears of law students and appease universities. Creating or expanding bar preparation courses, or hiring individuals dedicated with bar preparation, would be easy solutions—law students could participate in direct and tangible courses that were specifically designed to help them achieve bar exam success; law faculty could feel relieved that steps were being taken to help students; university administrators could feel confident that something was being done. Whether these bolstered existing courses or added to them, assuredly schools provided opportunities to their students. But… to what end? Something was done at many institutions. Has it been effective? Apparently not. The lagging (and falling) bar passage rates are a sign of that. Granted, perhaps the slide would be worse without such courses, but that seems like cold comfort to schools that have been trying to affirmatively improve rates. We now have the first evidence to that effect. A report commissioned by the California State Bar recently studied several California law schools that disclosed student-specific data on a wide range of fronts—not just LSAT and UGPA in relation to their bar exam score, but law school GPA, courses taken, even participation in externships and clinic. Five law schools provided data for this variable. Students averaged about 1.5 units (range 0 to 6). For all those students, there was a -.20 (p<.0001) correlation between the number of units taken and CBX TOTSCL [California Bar Exam Total Scale Scores]. The source of this negative relationship appears to be the fact that in five out of six [sic] of the schools, it was students with lower GPAs who took these classes. After controlling for GPA, the number of bar preparation course units a student takes had no relationship to their performance on the CBX. A follow up analysis, examining just the students in the lower half of GPA distribution, showed that there was no statistically significant difference in CBX TOTSCL for those who took a bar preparation course versus those who did not (p=.24). Analyses conducted within each of the five schools yielded similar findings. This should be a red flag for law schools seeking to provide bar preparation services to their students. In this student, whatever law schools are doing to help their students pass the bar has no discernible impact on students’ actual bar exam scores. Granted, these are just five California law schools and the California bar. And there has been other school-specific programs at some institutions that may provide a better model. But it’s worth law schools considering whether students are on a path toward improving bar passage success or simply on a hamster wheel of doing more work without any discernible positive impact. More studies and evidence are of course in order. But the results from the last several years, confirmed by the study of five California law schools, suggests that revisiting the existing the model is of some urgency. I've blogged before about the rise of non-JD legal education. Law schools increasingly rely on non-JD sources of revenue (now, 1 in 9 students enrolled in a law school are not a part of the JD program, up sharply over the last few years). I've also expressed some concern about the value proposition of some of those degrees, particularly given the high failure rate of LLM graduates on the bar exam. I thought I'd share a prediction, an update, and a new observation. First, I predict that non-JD enrollment will drop this year, the first such decline in some time. I suggested last year that the new presidential administration might lead to declines in foreign visitors to American educational institutions. I anticipate that will be true when it comes to non-JD education (and foreign students are a significant portion of such degree offerings). Even though the "Travel Ban 1.0/2.0/3.0" has been ostensibly limited in scope and had significant legal challenges (in addition to naturally-expiring deadlines), I think these formal legal postures are quite distinct from the pragmatic effect that even the rhetoric about such immigration restrictions would have on prospective foreign students. We should know more next month. Second, the New York bar is by far the most popular bar exam for foreign attorneys. This year, first-time test-takers from foreign countries had a whopping 57% pass rate, dramatically up from the historic 42%-46% pass rate in recent years. I don't know what would cause such an increase--more student from English-speaking countries; better bar prep; or any of a number of factors. But it's worth noting in light of my earlier concerns about the low bar pass rates. (The same kind of improvement took place in Texas: first-time pass rates among July test-takers rose from 20% in 2015 and 25% in 2016 to 44% in 2017.) Not all have secured a US non-JD degree, but many do as a prerequisite to taking a state bar exam. Third, law schools have discovered online non-JD legal education. It's not clear how such degrees fit into the overall marketplace (any more so than non-JD degrees more generally), and it might be that such opportunities will offset at least some of the loss of other non-JD enrollment. Indeed, breaking down traditional versus online non-JD enrollment in the last few years, online non-JD enrollment is up significantly, and traditional non-JD enrollment has flattened. Much of the most recent growth, then, has come from online non-JD degrees. While online non-JD degrees had enrollment of just 1590 in 2014, it nearly doubled to 2971 in 2016--and I expect is still larger for Fall 2017. 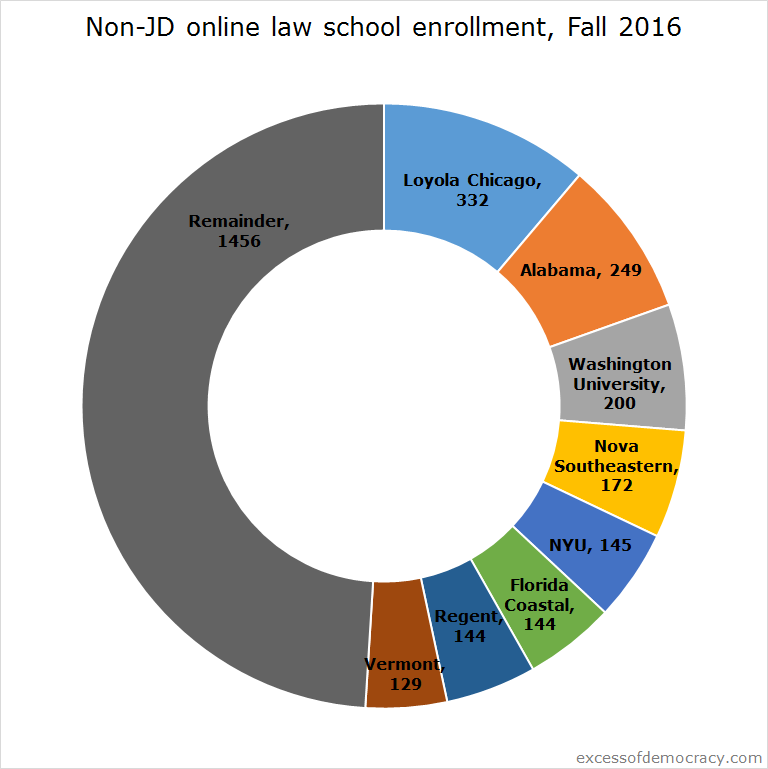 Only 38 schools had online non-JD programs in Fall 2016, but even that figure is deceiving. An eclectic crop of eight schools accounted for about half of all non-JD enrollment in 2016. Again, the Fall 2017 figures will be released soon, and we'll see what changes to these trends have taken place. I remain interested to know the place of non-JD degrees and the future trends of enrollment, and I'll always happily report more updates here.